Diseño of Rancho San Francisco. Reproduction. At the time this map was drawn, it included most of the Santa Clarita Valley. This is a map of the Santa Clarita Valley as it was known in the early 1840s when it was owned by the heirs of Antonio del Valle. We don't know exactly when or why this map was drawn; according to the Natural History Museum signage it dates to 1854, but that is not possible because it is signed by Manuel Micheltorena, who was governor from 1842 to 1845. California became a U.S. state in 1850; Micheltorena, who didn't hold office under American rule, died in 1853. "In 1843, the title of Camulos was momentarily clouded by a grant to Pedro Carrillo, but examination showing the overlap on the Rancho San Francisco Grant, the Carrillo grant was nullified." "After Ygnacio del Valle succeeded his father, Antonio, as owner of Rancho San Francisco," Rolle writes, "he confronted a host of seemingly insuperable problems. He had to raise money to purchase his sister Magdelena's share of the ranch and to 'prove up' his title to it under American law. Not until 1855 were squatter and other competing claims to Rancho San Francisco dismissed. Only in 1858 did Americans make the first patent survey of the rancho. Though quite rough, it described an area of some one hundred thousand acres. But del Valle, like other Latino land owners, was hard pressed to pay attorney fees and survey costs." Nor could he afford to prove it up (make improvements). The 1858 survey would have resulted from the (American) Land Claims Act of March 3, 1851, which required all persons who owned land under Mexican rule to file a claim, within two years, with the three-member Board of Land Commissioners. The prior government had accepted boundary definitions that were little more than "this rock over here to this tree over here to that river," but the U.S. government had a stricter sense of metes and bounds. The commission judged the claims, granted patents for those it upheld (with better-defined boundaries), and rendered the rest to the federal government, which granted them to homesteaders in 160-acre parcels. The 1858 survey fixed the rancho's boundaries at 48,612 acres. Not until 1875, long after the Del Valles had been forced to sell most of the ranch to pay creditors, did the U.S. government finally issue the patent. 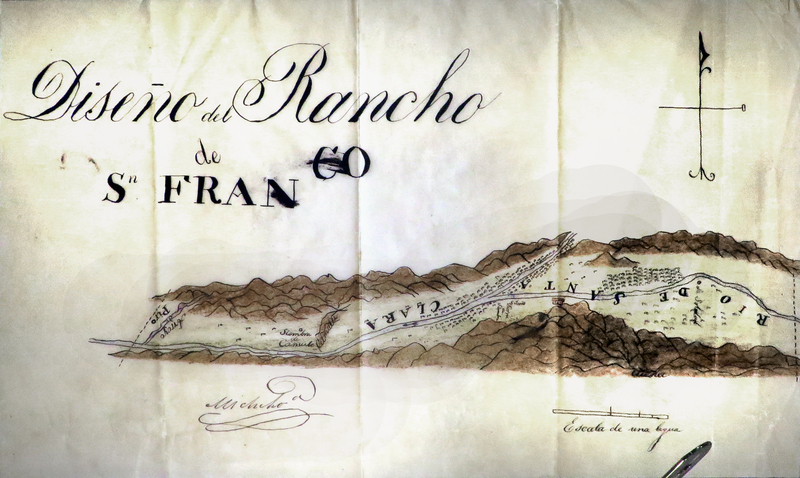 Diseño of Rancho San Francisco, 1854. Not to scale. Original size: 28x17 in. Editor's note: It's not 1854. The display, a reproduction, is probably to scale of the original, but the original is not to the scale of the valley's actual features. Considering the distance of Piru to Camulos at left, Soledad Canyon — between the "o" of Rio and the "d" of De — should be much farther to the right. LW2570a: 19200 dpi jpeg from digital image 11/23/2013 by Leon Worden.